There's a little bit of the adventurer in everyone, as the saying goes. Also there is a most interesting place where dreams can be imagined and where dreams become reality. Here's a place, both young and old, men and women, can see "toys and miniatures" in the eyes of the young, and things of beauty. Travel over Rte. 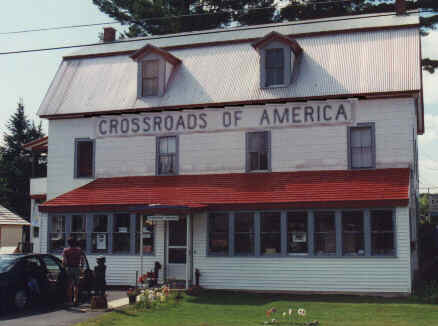 302 to the intersection of Trudeau Road in Bethlehem Junction, just west of Pierce Bridge, to the existing atmosphere at "Crossroads of America." Relive the youthful fantasies at the place where so many travelers to the beautiful mountain area flocked in days gone by. 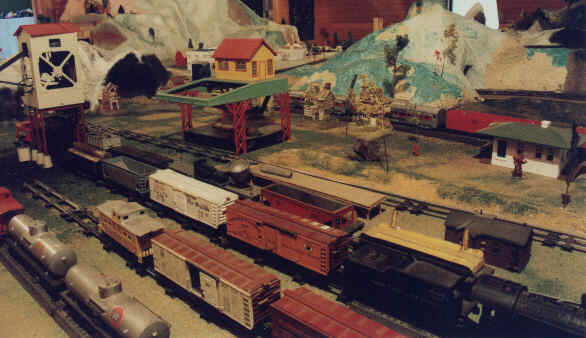 Housed in the large three story former boarding house, which has its own tales to tell, is a unique effort undertaken by one determined man to bring new interest to children and railroad buffs alike. 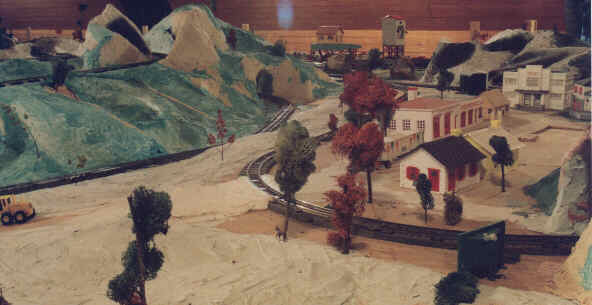 For here it is that your guide wants to share his keen insight in railroads and model building for ail to see. 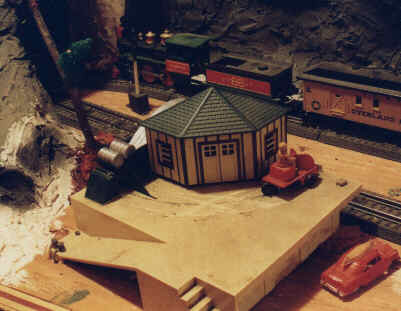 One enters the main entrance to be greeted by a warm, dark haired young man who, since the age of 8 years, has developed a love for railroading and model making. In his own inimitable way, he has gathered together a multitude of the many types that bring a new vision into the mechanical delights of the old and new in the giants of the rails. 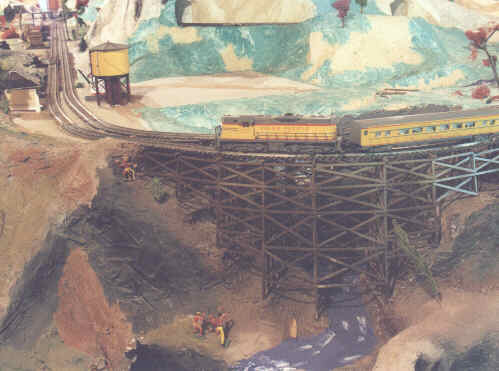 Many of the models, together with the extensive network of track, tunnels, mountains, buildings, and structures pertinent to railroad usage have been built by Roger with patience, diligent research, and concern for details. rail system that covers the large raised structure which supports this project. All this fills a very large room on the third floor of the building. From a controller platform your guide can direct, switch, transfer, and move trains of varying lengths forward and backward through a maze of switches, towns, yards, and countryside to the delight of the beholder. Imagine, if you will, the opportunity to "travel" on a particular car, engine or train with yourself "at the throttle" as one winds one's way through these mazes of trackage. Sound the whistle! Watch the locomotive belching puffs of smoke as it gets up a head of steam! Watch the mail car eject a mail pouch, better yet, get a chuckle at the cow that wanders onto a track and becomes startled at a train's approach and then "jumps" to the safety of the field. Electronics provides a great deal of the support mechanism for this marvelous display. Lights are controlled so as to take the visitor from daytime to night and back simulating a 24 hour scheduling of railroading at work. 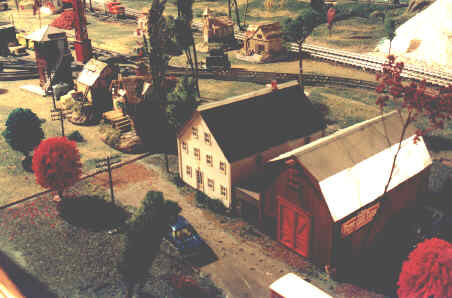 Model railroaders the world over go out of their way to see new layouts and innovations wherever they travel including Crossroads of America. Parents, do yourself and the kids a favor and go see a complete record of history in miniature! Teachers, what an opportunity to see how transportation can be traced through the many models that date back to the very earliest steam "engine." Have a class "lecture" and give them an exciting study in reality. It's an invaluable experience. 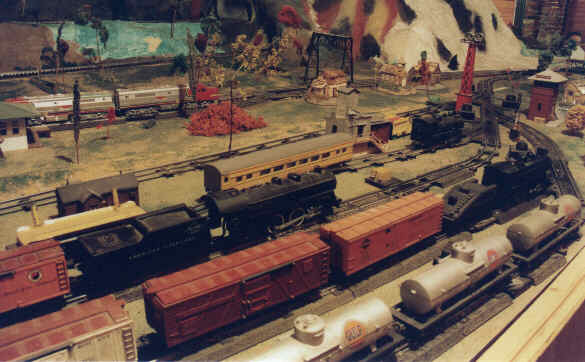 In addition, there are numerous fine models of autos, trucks, and other items to delight the visitor. SPECIAL DISPLAY OF OVER 40 ANTIQUE OUTBOARD MOTORS! "THE NICEST PEOPLE IN THE WORLD COME VISIT OUR EXHIBITORIUM"
Tours in the Museum are given every half hour.